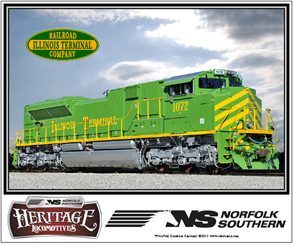 A hugh thanks to Norfolk Southern Railroad for their great Heritage Fleet of colorful new diesels. Presenting Norfolk Southern Railroads NEW 4000 AC44C6M, DC to AC diesel in a totally new color scheme with horse mane flying behind the cab. Available now. Presenting Norfolk Southern Railroads NEW 9-1-1 Diesel honoring America's first responders. 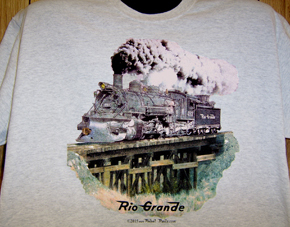 Royal Blue Tee with bright red and black locomotive. 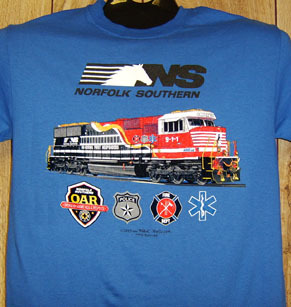 and featuring logos representing Police, Fire, and Medical responders. Available now. Coffee Mug featuring 20 of the latest Norfolk Southern Heritage diesels and the NS #1030 Anniversary Diesel: ALL 21 Diesels on one mug..... what a great mug for you and/or as a gift for that railhead everyone knows. 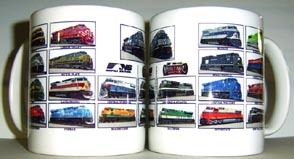 Coffee Mug featuring the Norfolk Southern Anniversary diesel #1030 and each of the 20 logos of predecessor railroads..... what a great colorful and informative mug for you and/or as a gift. 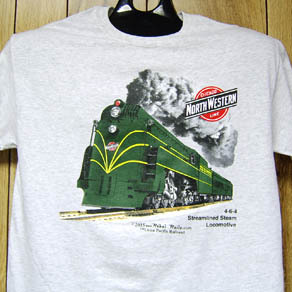 Presenting the beautiful Chicago & Northwestern Line Railroads fast and famous 4-6-4 streamlined steam locomotive used in crack passenger train service. 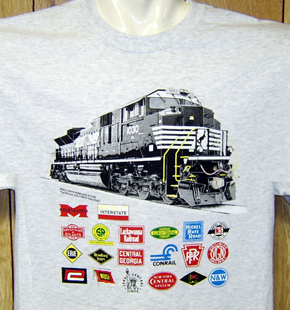 Norfolk Southern Heritage T-shirt featuring logos of the 20 predecessor railroads making up the NS Transportation System. The NS diesel is one of the newest in the fleet. Reading Bee Line. 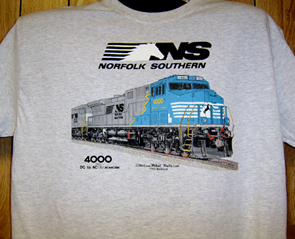 Norfolk Southern Railroads new diesel locomotive is featured on this light grey t-shirt in beautiful Reading Bee Line paint scheme. 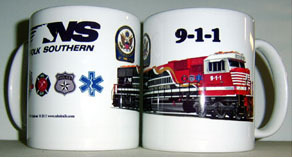 Coffee Mug featuring the newest CENTRAL of GEORGIA widebody diesel in the Norfolk Southern Railroads Heritage Fleet. 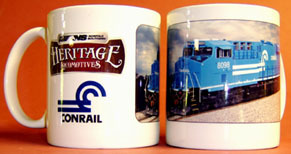 Coffee Mug featuring the newest CONRAIL widebody diesel in the Norfolk Southern Railroads Heritage Fleet. Coffee Mug featuring the newest ERIE widebody diesel in the Norfolk Southern Railroads Heritage Fleet. Coffee Mug featuring the newest ILLINOIS TERMINAL widebody diesel in the Norfolk Southern Railroads Heritage Fleet. Coffee Mug featuring the newest INTERSTATE widebody diesel in the Norfolk Southern Railroads Heritage Fleet. Coffee Mug featuring the newest LACKAWANNA widebody diesel in the Norfolk Southern Railroads Heritage Fleet. Coffee Mug featuring the newest LEHIGH VALLEY widebody diesel in the Norfolk Southern Railroads Heritage Fleet. Coffee Mug featuring the newest MONONGAHELA widebody diesel in the Norfolk Southern Railroads Heritage Fleet. Coffee Mug featuring the newest NORFOLK & WESTERN widebody diesel in the Norfolk Southern Railroads Heritage Fleet. Coffee Mug featuring the newest NKP NICKLE PLATE widebody diesel in the Norfolk Southern Railroads Heritage Fleet. 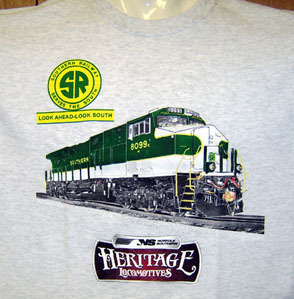 Coffee Mug featuring the twenty Norfolk Southern Railroads Heritage Diesels on the Spencer North Carolina turntable. Coffee Mug features the classic Norfolk Southern logo with flying horse mane. 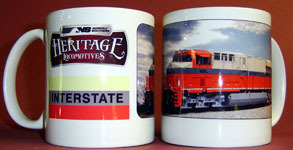 Coffee Mug featuring the newest original Norfolk Southern widebody diesel in the Norfolk Southern Railroads Heritage Fleet. 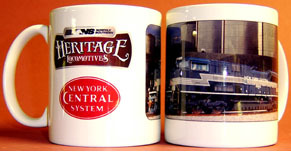 Coffee Mug featuring the newest NEW YORK CENTRAL widebody diesel in the Norfolk Southern Railroads Heritage Fleet. 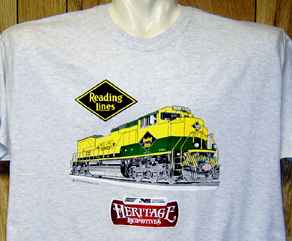 Coffee Mug featuring the newest READING widebody diesel in the Norfolk Southern Railroads Heritage Fleet. Coffee Mug featuring the newest SAVANNAH & ATLANTA widebody diesel in the Norfolk Southern Railroads Heritage Fleet. 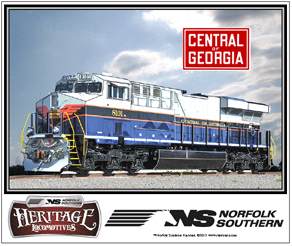 Central of Georgia diesel joins Norfolk Southern Railroads Historic diesel fleet. 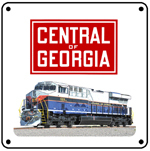 6 inch x 6 inch square tin sign of the historic Central of Georgia Heritage diesel. A powerful locomotive paint scheme. 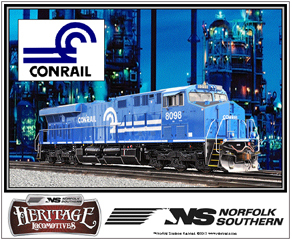 CONRAIL diesel joins Norfolk Southern Railroads Historic diesel fleet. 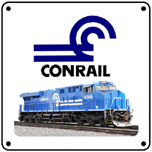 6 inch x 6 inch square tin sign of the historic CONRAIL Heritage diesel. A powerful locomotive paint scheme. 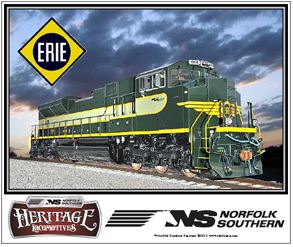 ERIE diesel joins Norfolk Southern Railroads Historic diesel fleet. 6 inch x 6 inch square tin sign of the historic ERIE Heritage diesel colors. A powerful locomotive paint scheme. 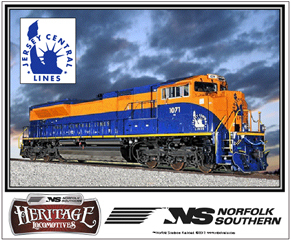 Illinois Terminal diesel joins Norfolk Southern Railroads Historic diesel fleet. 6 inch x 6 inch square tin sign of the historic Illinois Terminal Heritage diesel. A powerful locomotive paint scheme. 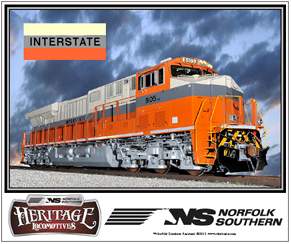 Interstate diesel joins Norfolk Southern Railroads Historic diesel fleet. 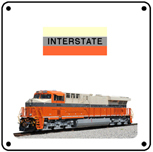 6 inch x 6 inch square tin sign of the historic Interstate Heritage diesel. A powerful locomotive paint scheme. 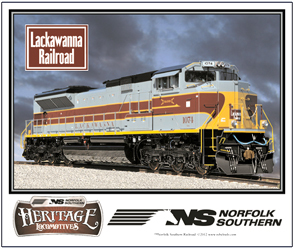 Lackawanna diesel joins Norfolk Southern Railroads Historic diesel fleet. 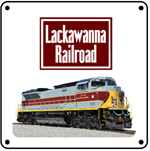 6 inch x 6 inch square tin sign of the historic Lackawanna Heritage diesel. A powerful locomotive paint scheme. Lehigh Valley diesel joins Norfolk Southern Railroads Historic diesel fleet. 6 inch x 6 inch square tin sign of the historic Lehigh Valley Heritage diesel. A powerful locomotive paint scheme. Monongahela diesel joins Norfolk Southern Railroads Historic diesel fleet. 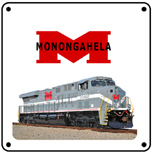 6 inch x 6 inch square tin sign of the historic Monongahela Heritage diesel. A powerful locomotive paint scheme. Mouse pad honoring the new Central of Georgia Heritage diesel operated by the Norfolk Southern Railroad. Mouse pad honoring the new CONRAIL Heritage diesel operated by the Norfolk Southern Railroad. Mouse pad honoring the new ERIE Heritage diesel operated by the Norfolk Southern Railroad. 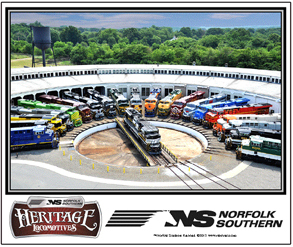 Mouse Pad featuring the Norfolk Southern Railroads Heritage fleet of 20 diesels around the turntable at Spencer Shops in July of 2012. The No. 1030 sits on the turntable. 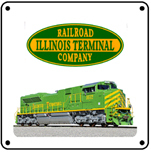 Mouse pad honoring the new Illinois Terminal Heritage diesel operated by the Norfolk Southern Railroad. Mouse pad honoring the new Interstate Heritage diesel operated by the Norfolk Southern Railroad. Mouse pad honoring the new Lackawanna Heritage diesel operated by the Norfolk Southern Railroad.